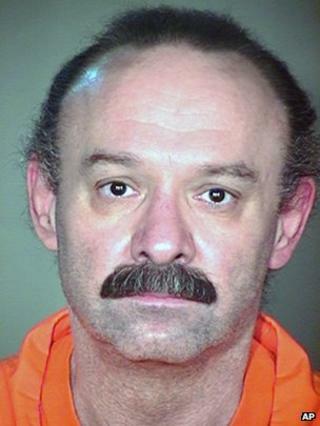 The US state of Arizona has halted executions pending a review of its death penalty procedures, after the allegedly botched lethal injection of a convicted murderer on Wednesday. Officials say Joseph Wood gasped and snorted after the lethal cocktail of drugs was administered to him. He took almost two hours to die. Wood's execution came as US death penalty states have increasing trouble obtaining the drugs used in capital punishment, amid a European export ban. The morning after Wood's execution, his lawyer Dale Baich demanded an independent inquiry into the death of his client. "He gasped and struggled to breathe for about an hour and 40 minutes," said Mr Baich, who unsuccessfully tried to halt the execution when he realised his client was still alive. The execution should have taken 10 minutes, his lawyers said, but Wood, 55, gasped more than 600 times before he died. In the weeks prior to the execution, Wood's team of lawyers had tried to stop it over doubts about the drugs being used. They sought the identity of the manufacturer of the sedatives and the qualifications of the executioners. Ultimately, the Supreme Court allowed the state to proceed with the execution. The state "fought tooth and nail to protect the extreme secrecy surrounding its lethal injection drugs and execution personnel," Mr Baich said. "An independent investigation, led by someone outside of the Department of Corrections and outside of the executive branch of state government, must fully explore the practices which led to tonight's horrifically botched execution." In a statement announcing the temporary moratorium on executions, Arizona Department of Corrections Director Charles Ryan defended the execution and criticised media descriptions of it as "botched" as premature and "erroneous". "This is pure conjecture because there is no medical or forensic evidence to date that supports that conclusion," he said. He said the execution team, including a licensed medical doctor, verified multiple times during the procedure that Wood was "comatose and never in pain". "The record clearly shows the inmate was fully and deeply sedated beginning at 13:57 - three minutes after the administration of the execution drugs - until he was declared deceased at 15:49," he wrote. And he said a post-mortem examination showed the IVs delivering the lethal drugs were "perfectly placed". Arizona Governor Jan Brewer likewise defended the execution. "By eyewitness and medical accounts he did not suffer," she said. "This is in stark comparison to the gruesome, vicious suffering that he inflicted on his two victims, and the lifetime of suffering he has caused their family." With more states failing to get hold of the chemicals, some are looking for alternatives. Earlier this month Tennessee introduced a law to bring back the electric chair, if there are no supplies of the drug. But this too is likely to be subject to legal challenges. There might be an outcry over this latest execution, but the death penalty is still supported by many in the US, especially in southern states where most executions take place. Many argue it is a just punishment for those who have committed the most heinous of crimes. The relatives of Wood's victims, his estranged girlfriend Debra Dietz and her father Eugene Dietz, dismissed the controversy over what happened in the death chamber. "This man conducted a horrific murder and you guys are going, let's worry about the drugs,'' said Richard Brown. "Why didn't they give him a bullet?" It is the third botched execution in the US this year, and likely to further fuel the debate about the use of lethal injections. Many US states are trying new execution drugs because some European countries have imposed export bans on drugs that will be used in executions. Maya Foa, a director at campaign group Reprieve, accused Arizona of torture and of "jettisoning due process and cloaking the procedure in secrecy". A judge in an earlier hearing over the Wood case suggested that the firing squad might be more humane. Will firing squads make a comeback in the US?